What do the Germany World Cup Team and the Boston Red Sox have in common? That was my opening question to the executives attending last month’s Elemica reveal 2014 Conference in Frankfurt. The answer: Both teams illustrate that past performance is no guarantee of future results. The German team overcame disappointments in 2006 and 2010 to win the World Cup this year, while favorites Spain (the defending champion) and Brazil (the host country) were humbled by the competition. Meanwhile, the Red Sox won the World Series in 2013, going from worst to first in one year — and then back to worst in 2014. Past performance is no guarantee of future results — it’s true in sports, and it’s true in business. As I wrote earlier this year in Is Your Business Model Safe?, the biggest challenge supply chain and logistics professionals face today is not change, which is something they have always faced, but keeping up with the rapid pace of change across a variety of dimensions — technology, regulations, economic and political landscapes, demographics, and so on. Therefore, one of my key messages to the attendees was that their companies won’t be able to “succeed despite” anymore — that is, unlike the past, they won’t be able to succeed despite having poor visibility and control of their supply chains; despite having outdated and inflexible IT systems; despite not taking a holistic perspective of their end-to-end processes; despite not having timely, accurate, and complete data; and the list goes on. I also shared with them my view that companies will ultimately find opportunities for supply chain innovation at the intersection of Software, B2B Connectivity, and Social Networking — a trend best illustrated by the rise of Supply Chain Operating Networks (SCONs). I also moderated a panel discussion with Michael West, Global Logistics Excellence Manager at Syngenta, and Cindi Hane, VP of Product Management at Elemica, where we discussed (among other topics) the right metrics for measuring the value of SCONs, how to get people to move away from “the way we’ve always done things” to working in new and different ways, and the impact regulations are having on logistics processes. It’s impossible for me to capture all of the great insights shared by the speakers in a brief blog post, but here are some highlights and key takeaways. Dr. Herzog underscored the rapid pace of change companies are experiencing. “To successfully compete today, companies have to be quick, agile, flexible, and accurate,” he said. “But at the same time, supply chains are challenged by complex logistics, systems issues, legal requirements, and lack of resources.” A key benefit of SCONs, from Dr. Herzog’s perspective, is that they “reduce the amount of non-value adding work,” which frees up time for companies to focus on more important work, such as optimizing their flow of materials and goods and improving the way they manage internal and external relationships. 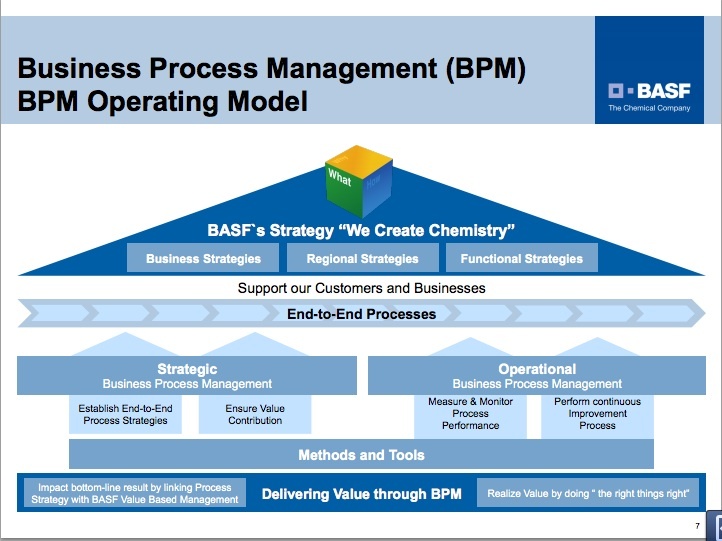 Ralf Kahre and Patrick Gött began their presentation with an overview of BASF’s Business Process Management (BPM) Operating Model, and then discussed how they applied the model to improve the Purchase-to-Pay (P2P) process. Once fully deployed, about 4,100 vendors will interface with BASF via the VIP, processing about 120,000 purchase orders and 145,000 invoices annually. Moving forward, BASF is working on different projects to improve end-to-end supply chain visibility, like track and trace for products from BASF to end users and transport visibility. Shell Chemicals (“Shell”) uses several of Elemica’s logistics solutions, including Road Transport Execution, which enables Shell to connect and collaborate with its land-based transportation providers for shipment booking, execution, and visibility, and Time Slot Booking/Optimization, which enables the company to schedule and manage carrier appointments to optimize site and carrier resources. Herman Woltjes provided a great overview of how Shell is leveraging these solutions to streamline processes and costs. 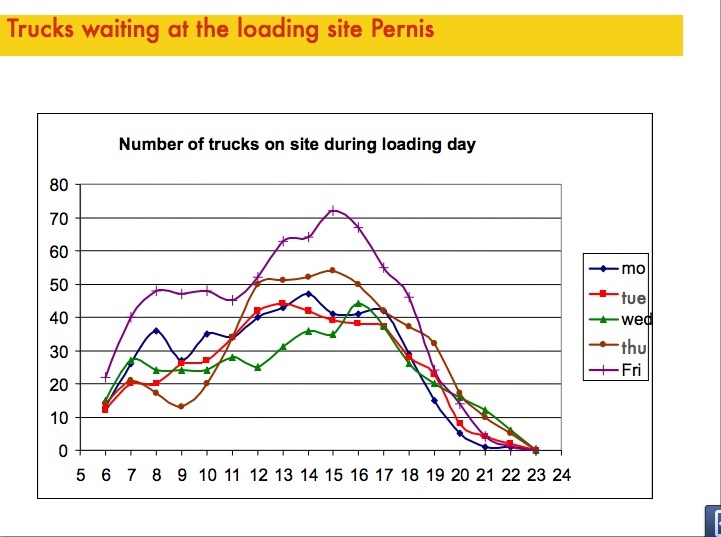 For example, prior to implementing Time Slot Booking/Optimization at the company’s Pernis facility, there would be as many as 70 trucks waiting because they would all show up at roughly the same time. The net result was high detention charges and inefficient use of labor. Shell achieved additional benefits by implementing optimization capabilities — i.e., the ability to apply constraints and preference logic to the slot booking process, such as the ability to adjust scheduled loading time based on the amount of product being loaded, and the ability to prevent carriers from leaving 30-minute gaps between slot bookings. Gelangenserklärung (“Confirmation of Arrival”) was a hot topic of conversation at the conference. Simply put, it’s a regulation that went into effect a couple of years ago requiring companies to verify that goods shipped from Germany to another EU member country actually arrive there. Receivers, therefore, have to confirm receipt of goods, and there’s a whole list of information that companies must provide. The purpose is to enable German tax authorities to better track those deliveries, since deliveries within the EU are not subject to VAT. Earlier this year on Talking Logistics, Cindi Hane discussed this law and how proof of delivery (POD) applications and SCONs can help companies comply with the requirements. Watch the short video clip below for her comments.